I suppose it's safe to say if chicken and peanut sauce are involved, the recipe is bound to be a win in our house. There was the Indonesian chicken (crockpot meal!) with peanut sauce, the Thai chicken peanut panini, and then the peanut noodles with chicken and vegetables. We loved them all, so I couldn't resist bringing back the ingredient pair for yet another recipe. 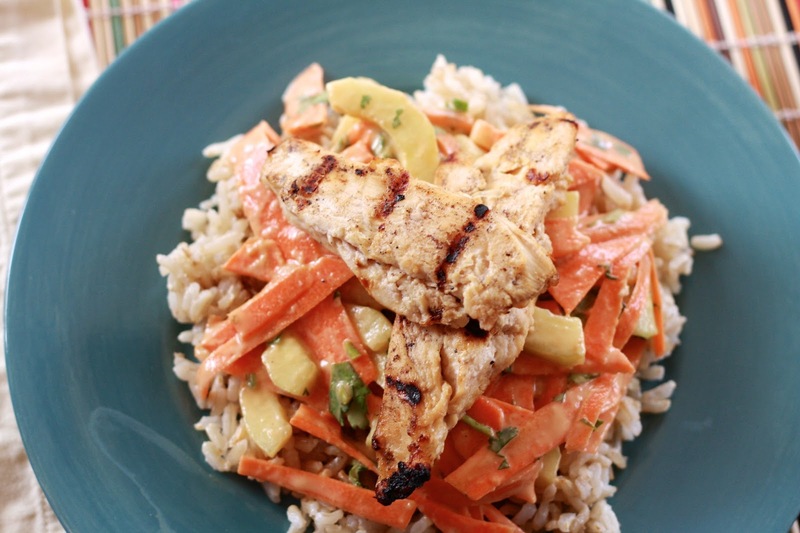 This dish includes coconut milk in both the chicken and the rice. Its flavor isn't all that noticeable in the chicken, but the marinade tenderizes the chicken before its grilled. The rice, on the other hand, imparts a nice coconut flavor. The contrasting sensation of the hot rice and grilled chicken sandwiching the chilled cucumber carrot salad worked well. How else do you use peanut sauce? I'm thinking pizza is next! 1. Whisk together 3/4 cup coconut milk, 2 tbsp lime juice, ginger, tamari, 2 tsp brown sugar, and Sriracha in a medium sized bowl. Set aside 1/4 cup of the mixture in a small bowl. Set aside. 2. Add chicken to the remaining marinade. Cover bowl and refrigerate for at least two hours, or overnight. 3. Whisk peanut butter into reserved 1/4 cup coconut milk mixture. 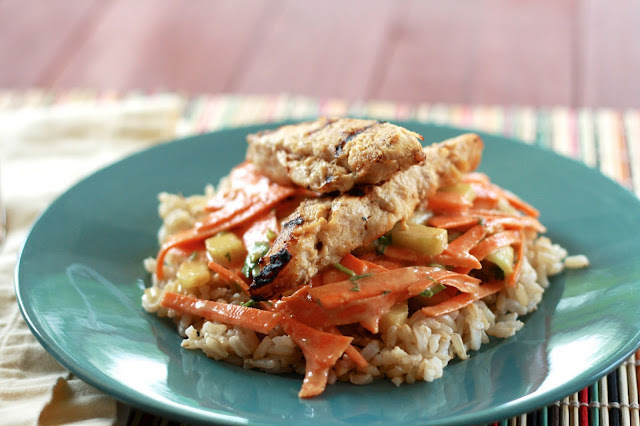 Toss mixture with cucumber, carrots, 2 tbsp lime juice, remaining 1 tsp sugar, cilantro, and salt in a medium bowl. Toss to combine. Cover and refrigerate until ready to serve. 4. When ready to cook, place rice, remaining coconut milk, and 1 1/4 cups water in a medium saucepan. Over medium-high heat, bring to a boil. Cover, reduce to a simmer, and cook until liquids have been absorbed (30-40 minutes). Fluff with a fork. 5. While rice cooks, thread chicken on skewers. Discard marinade. Cook chicken on grill over medium heat until cooked through, about 4 minutes. 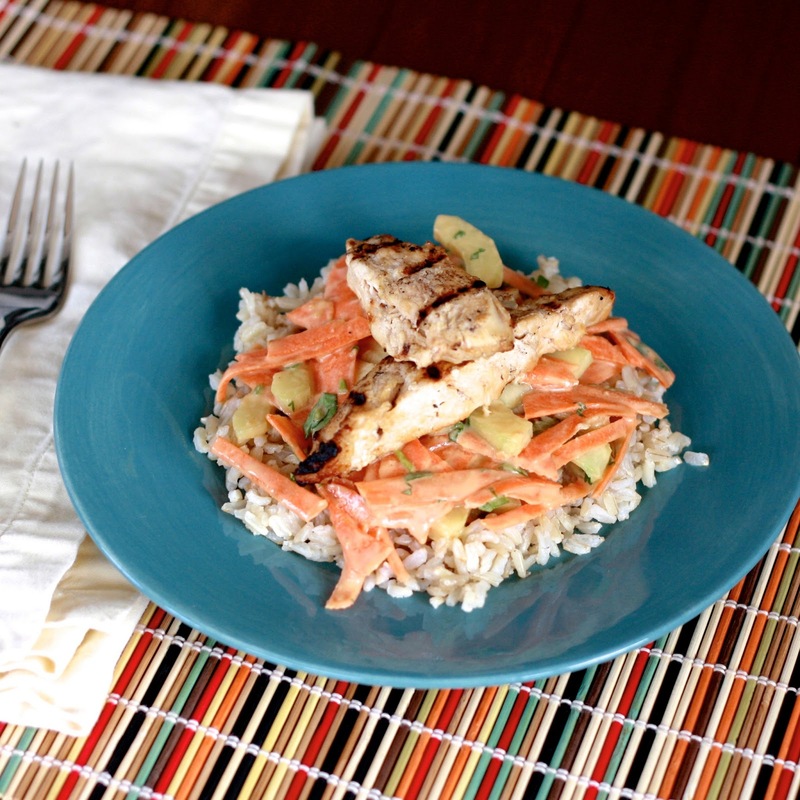 Serve chicken with rice and cucumber salad.